Why is economical marine renewable energy taking so long? Abstract: Methods for processing multibeam echo–sounder (MBES) bathymetry data are well established, however, there is no universal and established approach to processing and interpretation of MBES backscatter data. The aim of this paper is to (1) detail the different backscatter logging methods implemented in modern high–frequency MBES systems used primarily in shallow water; (2) describe and suggest appropriate methods of data processing; and (3) discuss likely errors and artefacts expected from MBES backscatter processing. These issues are illustrated using data collected with a Reson SeaBat MBES in coastal shelf areas of Australia, although the methods and errors discussed are relevant to other high–frequency shallow–water MBES systems. Production of backscatter mosaics and analysis of backscatter for seafloor classification using MBES data are considered in Part 2 – Mosaic production, analysis and classification (Parnum and Gavrilov, 2011), published alongside this paper. Abstract: Backscatter measurements collected with high frequency multibeam echo–sounders (MBES) have been used to map the spatial distribution of seafloor types and properties in shallow waters. The methods for collection and processing of MBES backscatter data were considered in Part 1 – Data acquisition and processing (Parnum and Gavrilov, 2011), published alongside this paper. The aim of Part 2 is to describe the main methods used to produce backscatter maps of the sea floor free from angular artefacts, and to classify seafloor types based on backscatter and bathymetry analysis. These methods are illustrated using a dataset collected with a Reson SeaBat 8125 MBES in Esperance Bay in Western Australia, although the methods and errors discussed are relevant to other high–frequency shallow–water MBES. Abstract: The following paper presents the differences in the development of the Danish and UK wind industry in order to highlight key issues that led to their respective success and failure. By comparing the political, economic, social and technological policies that have defined the growth of the two industries, the paper contends that the lack of a clear and consistent market price support mechanism together with a slow planning process and delayed grid access were significant weaknesses in the UK. It also suggests that these factors must be addressed to ensure the same barriers do not stunt the growth of the UK marine renewable industry. To maintain the lead in an emerging marine energy industry, the UK government must facilitate strong public support for wave and tidal energy in parallel with assisting with R&D and project capital grants. Clear and consistent policy with regard to price support mechanisms and priority access to the grid are necessary to ensure a stable and reliable market. Lessons learned from the success of the Danish wind industry must be applied if the UK wishes to secure a stronghold in this market. Abstract: This paper recommends that the reliability, obsolescence and integrity management processes related to subsea fields should be integrated into a single process, here termed ‘life cycle management’, because they all treat in a similar way with the same systems, the overall aim being to maintain system integrity and availability throughout field life. This paper asserts that all three processes should commence early in the design phase of a project and be carried through to decommissioning. It also discusses failure modes, effects and criticality analysis (FMECA) which, it is proposed, should be developed into an integrated system in support of life cycle management, reflecting the root causes of failure as a means of identifying effective and measurable mitigation activities. Abstract: This article examines, in the wake of the Fukushima incident, the adequacy of operational safeguards and national and international control measures and oversight established to mitigate the health and safety and environmental risks posed by the ultra–hazardous shipments of highly radioactive materials between Europe and Japan. It describes the technical measures taken to ensure safety, primarily through package design and secondarily by way of ship design and ship–based measures. It then critically examines the international regulatory requirements and guidance for package design and ship–based measures, including those governing loss, monitoring and possible recovery of cargoes in the deep waters normally frequented, or elsewhere at sea. Finally it considers the pressures from many concerned en route states (and non–governmental organisations (NGOs)) for further regulation, notably in the form of routing restrictions, prior authorisation or informed consent regimes or notification regimes. Conferences – time for a new approach? Abstract: Awareness of important factors for coral reef growth helps reveal how reef ecosystems react following major anthropogenic and environmental disturbances. Physical measurements by SCUBA divers, together with an underwater remotely operated vehicle (ROV), have been used to study environmental and climate effects on corals on fringing reefs in Jamaica. The period of this study, from 2002 to 2008, covers the major Caribbean-wide bleaching event of 2005. For 624 non-branching corals at Rio Bueno and Dairy Bull reef near Discovery Bay on the north coast of Jamaica, skewness values for coral populations at the two sites showed generally positive values, indicating that small colonies predominated over large colonies. Measurement of coral sizes together with growth rates allowed the estimation of recruitment dates. This was done for 235 non-branching corals near Kingston Harbour, on the south coast of Jamaica. The aim of this study was to use coral size and population dynamics as a metric for coral resilience, and to assist marine park managers of coral reefs with regard to coral recruitment and growth. The data show that while recruitment of small corals was returning after the major bleaching event of 2005, larger corals were not necessarily resilient. Therefore there is a need for careful management if the reefs are to survive such major extreme events. Abstract: As part of the European Marine Ecosystem Observatory (EMECO) initiative, the web-based EMECO Datatool has been developed, enabling rapid integration and visualisation of multi-platform, multi-parameter and multinational data at a regional scale. It delivers transparent, auditable, cost-effective, policy-relevant information, e.g. suitable for assessing good environmental status for the EU Marine Strategy Framework Directive. Currently, there are 14 biological, chemical and physical parameters sourced from traditional and novel observing platforms, which users can query and view as integrated datasets, time-series plots and bespoke assessment maps. Following successful completion of its original purpose (an integrated map of chlorophyll for the North Sea), the range of data sources and the spatial domain are currently being extended within the tool. 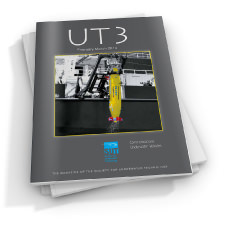 Abstract: This paper describes the work undertaken during the design, construction and test phases of a radical new format of unmanned surface vehicle. This semi-submersible design offers seakeeping characteristics that reduce the weather downtime during hydrographic surveys and significantly improve data quality. The vehicle detailed within this paper has both commercial and military applications in efficiently deploying sensors at sea. 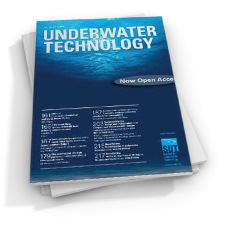 Abstract: This paper describes as-built position methodology and execution processes that delivered better than ±50mm relative positioning of pin piles over 90m baselines, in 175m water depth. The piles were installed to allow immediate stabilisation of 15 800 tonne jackets docked onto the piles. Updated processes for a future installation are visited to see how lessons learned on the project can be integrated into a future project. Abstract: Total Exploration and Production Congo placed an operational survey contract in 2008 for the detailed evaluation of the use of inertial navigation systems (INS) for the provision of subsea metrology surveys. The inertial system was used offshore in parallel with conventional acoustic positioning systems commonly used for metrology surveys. This paper presents multiple datasets from this work, as well as operational timing discussions reviewing the efficiency of these operations, and compares inertial techniques with conventional methods. The paper concludes that inertial systems can provide the required survey accuracy while consuming significantly less operational time and resources than conventional techniques. This paper discusses the last three years of field operations and compares the results and operational benefits of the conventional and inertial techniques. Abstract: There is little information about the effects of sound on marine life. In spite of this high uncertainty, several new legal limits to sound levels in the marine environment are being introduced. The present paper summarises the conclusions drawn at a workshop that took a prospective view of the technological developments necessary in order to make significant progress with reducing these uncertainties. These developments would mainly aim to further the understanding of how sound may affect some of the most vulnerable marine species. The most important methods available to examine the effects of sound will involve the development of instruments that measure the received levels of sound at the animal and its behavioural response. The availability of power to operate instruments used in remote sensing is the main factor that limits most aspects of technology capability. Alternatives need to be developed to using sparse data (from a few instruments that are attached to animals or that are widely spaced), and a coordinated approach is required between commercial suppliers and academics to overcome the current constraints, foster innovation and turn new approaches into operational tools. There is also a need to improve the technology used to attach instruments to animals, particularly in the case of small cetaceans. Improved bandwidth for data communication, recovery or retrieval is likely to develop alongside other innovations as a result of improvements in large-scale infrastructure such as satellite systems. There is scope for innovation of sensors to improve the ability to measure behavioural/physiological response variables such as heart and/or respiration rate. Abstract: Ocean models require independent datasets to verify forecast accuracy. Glider data, within an appropriate reference frame, can satisfy this constraint. In the present paper, profiles from the northwest Mediterranean Sea are re-gridded to allow evaluation of modelled deepwater formation episodes. Time-series analysis of temperature, salinity, mixed-layer depth and ocean heat content show that the simulated response to surface flux is consistent with observations and the evolution of convective events is well represented. However, discrepancies in the distributions of the simulated Levantine Intermediate Water (LIW) and western Mediterranean deep water (WMDW) remain. A new ‘sweep’ methodology, developed in the present paper, indicates that the location and duration of the simulated convective events are consistent with that observed, but spatial variability is underrepresented. Variogram analysis ascribes integral scales similar to those observed for the mixed-layer depth, but suggests that simulated scalar fields are too diffuse. The ability to maximise the separation of temporal and spatial variability, inherent in this new methodology, confirms that glider data is suitable for validating high-resolution ocean models. Abstract: One of the primary issues in the offshore oil and gas development is the comparative evaluation of subsea production versus other alternative means. Another issue of importance is assessing the technologies to be used for each concept. 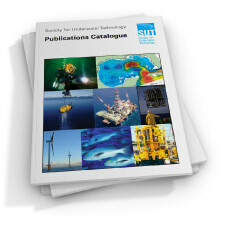 The present paper concentrates on such assessments and aims to develop a method for selecting the most appropriate technologies or components for the subsea production systems. Financial viability is the main driver of the concept selection, but the most important decision variables for selection are: technology readiness, reliability and availability, constructability, maintainability, operability and costs. Technology selection requires the combination of these decision variables, as they impact both cost and benefit. The paper provides an integrated analytic framework, using the analytic hierarchy process (AHP) for technology selection that best satisfies all of a decision-maker’s requirements. A survey of all decision influencing factors is presented in the present paper, as well as a case study, a sub-set of which is used to demonstrate the selection process between two subsea trees manufactured by different suppliers. The emphasis is on the practicality and accessibility of AHP. Abstract: The application of full subsea processing to develop remotely located marginal fields offshore West Africa is an attractive option for breaking the techno-economic barriers which have long hindered the development of these fields. Some of the fields have remained marginal and unproduced over the years, arguably owing to incorrect estimates in recoveries and economics occasioned by erroneous estimates in basic input parameters. Therefore, the right method of application for developing marginal fields must be sought to ensure that both national and international operating companies partake in the development of these fields. The present paper explores the use of full subsea processing (FSP) technology to develop marginal fields economically. Abstract: Black bream, Spondyliosoma cantharus (L.), are summer visitors to the south and west coasts of the UK, overwintering in deeper waters and migrating inshore to breed from April to June. Bream are demersal spawners, with the eggs laid in a nest excavated by the male as it creates a depression in a sandy gravel substrate. To build their nests, male bream expose bedrock and gravel by using their tails to remove the surface layer. The present study, using sidescan sonar and SCUBA diving, extends the known occurrence of extensive nesting grounds off the West Sussex coast to the Isle of Wight and Dorset. The nests are typically circular craters 1–2m wide, and 5–30cm in depth, which can clearly be seen using sidescan sonar as groups of circular depressions. Several thousands of eggs (1–2mm) are attached to bare rock in the centre of these structures. All the eggs hatch by July. The species is valuable and particularly vulnerable to exploitation by both sport and commercial fishermen during its nesting season. With no minimum landing size and no prescription for Total Allowable Catch or the International Council for the Exploration of the Sea (ICES) stock assessment, they are suitable for protection under spatial planning measures, such as through the use of marine protected areas (MPAs). 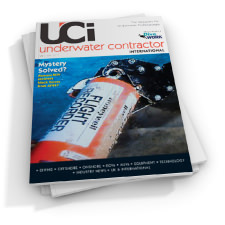 Abstract: Obtaining accurate and affordable geo-referencing is not straightforward for divers because there is a lack of through-water penetration by global positioning systems (GPS). Although a number of commercially available systems exist, few are low-cost or operationally flexible enough for use in scientific diving. 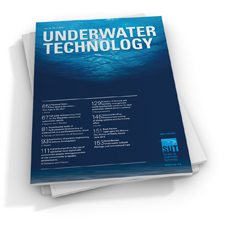 The present paper details a new GPS diving computer that supports navigation and Global System for Mobile Communications (GSM) underwater. The unit displays the distance and heading information to set points and tracks the dive in three dimensions (position, depth and time). When downloaded, the tracked dive profile can be visualised in 3D in Google Earth. By synchronising the dive computer clock to external recording devices (for example, cameras), any recording event can be geo-referenced with attached data relating to GPS position, temperature and depth. Abstract: Professional divers often dive in conditions of very low visibility. In such situations, a head-up display has many advantages as water clarity does not affect the ability to see the display. In addition, a head-up display allows divers to continuously monitor all relevant dive data without interrupting their work. The present paper details the development of a new diving computer that has been designed with a head-up display and integrated into an AGA type full face mask. The device includes a full colour display, depth sensor, tilt-compensated compass and a tank pressure sensor. Typical dive relevant data (depth, time, decompression obligations) including tank pressure and heading are displayed and stored in the internal flash memory. Abstract: Artificially rebuilding beaches is one of the main methods used to stabilise or restore them after severe erosion events. Best practices should involve some form of monitoring prior to, during and post beach re-building. The most frequently applied monitoring techniques for Italian (and Mediterranean) beaches are topographic and bathymetric surveys carried out in regular time intervals in order to understand beach evolution. Morphological studies, based on grain-size profile analyses, can indicate the sedimentary evolution of the beach. In the present study, SCUBA diving techniques were employed in addition to traditional survey methods in order to monitor two study areas along the Ligurian coast (northwest Mediterranean Sea): Ospedaletti and Genova Vernazzola. In particular, a diver-operated, cost-effective coring system obtained marine sediment cores, and video transects and inspections generated information on the status of coastal defence structures (e.g. groynes). Using those methods, the main vertical discontinuities along the submarine beach were identified, as were points of erosion on the submarine parts of groynes. Such innovative techniques provided data that are not easily achievable with traditional monitoring techniques. Future monitoring programmes should consider these new methods as a way of improving assessment efficiency. Abstract: In 2008 and 2009 the Archeotema society (Venice, Italy) was contracted by the Libyan government to outline a project for the management of the underwater archaeological sites of Libya as places for underwater tourism. The project was part of a general remit of Evaluation and Conservation of the Cultural Libyan Heritage. A selected site was Apollonia in Cyrenaica. The ancient harbour with all its structures allowed for the visualisation of a real park with an itinerary for divers and a glass-bottom boat for people to see from the surface.